The Availability & Pricing tab lets you define what countries your app will be available and whether your app will be free or paid. The following table describes each field. Tip: The Availability & Pricing tab has recently been enhanced several updates. See Revamped Experience of Availability and Pricing Section During App Submission for details. Where would you like this app to be available? The countries and regions where you want your app to be available. By default, your app will be available in all countries. For more details about international distribution, see Distributing Your App Internationally. Is your app free or paid? If your app doesn't cost anything to download, select Free. If you're charging for your app, select Paid. Then enter a base list price and currency from the drop-down menu. You also have the option of allowing Amazon to calculate list prices for you for other countries. Apps have minimum base list prices. For more details, see Charging for Your Apps. When would you like publishing to start? 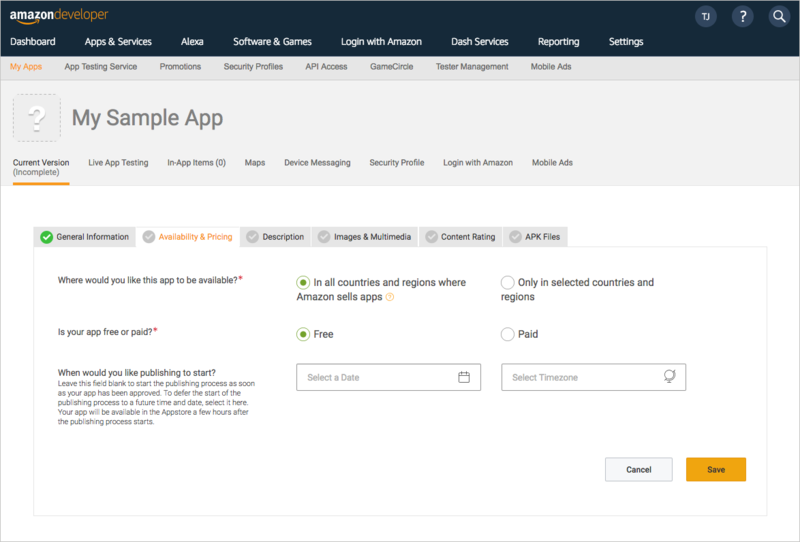 Specify the time and date when you would like your app to be available in the Amazon Appstore. 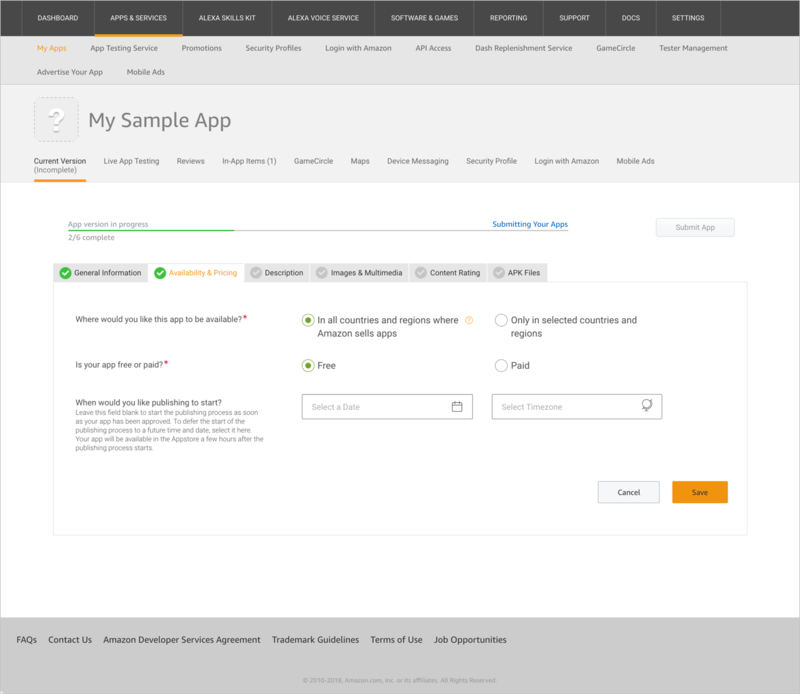 Leaving this field blank (the default) enables Amazon to make your app available as soon as it passes Amazon's testing. Note that your app will be available in the Appstore a few hours after the time you select. The time you select will start the publishing process at that time. The publishing process can take a few hours before your app is live and available to customers. If you need to change the publishing date or time, contact us. Whenever you create a new app, it is set to be available in all countries by default. To change international availability, you can select the countries where your app is available. You can also select localized versions of your app to be available in specific locales. For more details, see Distribute Your App Internationally. If you charge money for your app, or your app includes In-App Purchasing (IAP), or uses Amazon Mobile Ads or Amazon Mobile Associates, you must fill out payment, banking, and tax information in your developer profile. The price that you set for each marketplace is your suggested list price, which includes any VAT or similar taxes that apply in that marketplace. The system displays this list price to end users (along with a note that all prices include VAT). Any VAT or similar taxes are deducted from the list price when calculating Royalties. For details about app payments and royalties, see Understanding Amazon Appstore Payments. Note that paid content is not currently available through Amazon Appstore in Mexico or India. Note that when referencing the price for IAP items in an app, you should dynamically pull the localized price displayed with the PurchasingService.getProductData() method to ensure you do not encounter a price mismatch error. Go to the next step: Step 4: Add Descriptions.